EVERY OF THE STUFF: SON OF A SAILOR // PRESS: Best Booth at POOL Tradeshow! 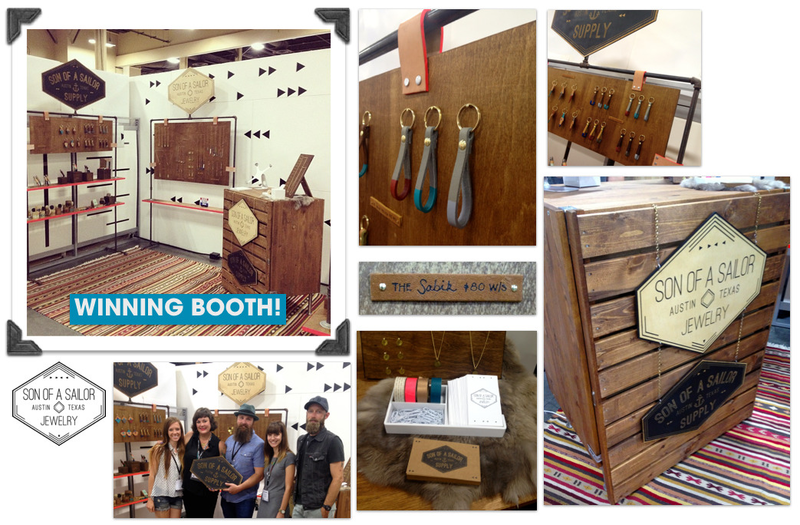 SON OF A SAILOR // PRESS: Best Booth at POOL Tradeshow! CAMP Design Group scoured the floors at POOL in search of the most carefully curated, well designed booth. Congrats to Son of a Sailor for winning! They’ve been awarded a free booth at POOLTRADESHOW in February 2014. They paid attention to detail: pink edges ran through the whole booth, even down to a pink string that ran down the booth. It was clean & uncluttered. Felt like a retail store in the way it was merchandised. The design is current, yet attainable & cost-friendly, using inexpensive materials like wood, metals & leather. It stayed within perimeters, yet thought outside the box. Congrats, Son of a Sailor!